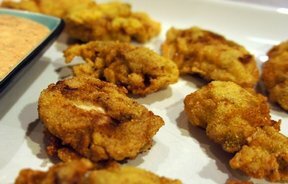 Corn meal and flour coated oysters fried up in oil. How can it get much better? Well, add a horseradish sauce to dip them in and it gets a whole lot better! Combine meal, flour and Creole seasoning, stirring well. Combine eggs and milk, beating well with a fork. 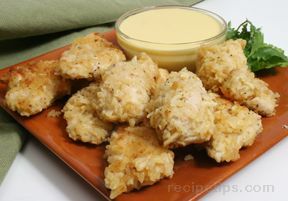 Dip oysters in egg mixture and dredge in flour mixture. Pour oil in deep skillet or Dutch oven to about 2 inches deep. 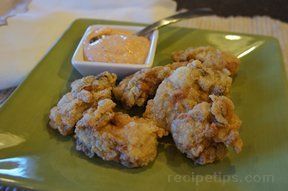 Heat oil and fry oysters until golden brown, turning once. Drain on paper towels. For sauce, combine all ingredients and stir to combine. Refrigerate until oysters are ready. "Very good. The cornmeal adds a little sweetness with a touch of heat in the cayenne. I would even add a little more cayenne. Be sure to sprinkle with salt right out of the oil."